Porphyry is a variety of igneous rock consisting of large-grained crystals, such as feldspar or quartz, dispersed in a fine-grained feldspathic matrix or groundmass. The larger crystals are called phenocrysts. In its traditional, non-geologic use, the term "porphyry" refers to the purple-red form of this stone, valued for its appearance. Later, the name was generalized to igneous rocks with large crystals. Historically, purple was regarded as the royal color, and porphyry was prized for various monuments and building projects in Imperial Rome and later. For example, it was used for the columns of Hagia Sophia (in Constantinople, now Istanbul) and in the "Porphyra", the official delivery room used by pregnant empresses in the Great Palace of Constantinople. Today, there are at least 134 porphyry columns in buildings around Rome, all reused from imperial times. 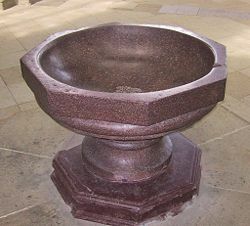 In addition, countless altars, basins, and other objects are made from this stone. The word "porphyry" is derived from a Latin term that means "purple." Purple was the color of royalty, and the "Imperial Porphyry" (noted below) was a deep brownish-purple igneous rock with large crystals of plagioclase. In the first stage, the magma cools slowly deep within the crust, creating the large crystal grains with a diameter of 2 millimeters or more. In the second stage, the magma is cools rapidly at relatively shallow depth or as it erupts from a volcano, creating small grains that are usually invisible to the unaided eye. The cooling also leads to a separation of dissolved metals into distinct zones. This process is one of the main reasons for the existence of rich, localized metal ore deposits such as those of gold, copper, molybdenum, lead, tin, zinc, and tungsten. 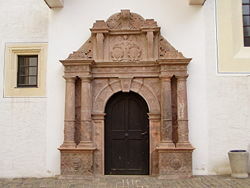 The porphyry portal of the "church house" at Colditz Castle, Saxony, designed by Andreas Walther II (1584), exemplifies the exuberance of "Antwerp Mannerism"
Pliny the Elder’s Pliny's Natural History stated that the "Imperial Porphyry" had been discovered at an isolated site in Egypt in 18 C.E. by a Roman legionnaire named Caius Cominius Leugas (Werner 1998). It came from a single quarry in the Eastern Desert of Egypt, from 600 million-year-old andesite of the Arabian-Nubian Shield. This quarry, named Mons Porpyritis ("Porphyry Mountain," the Arabic Jabal Abu Dukhan), seems to have been worked intermittently between 29 and 330 C.E. The road from the quarry westward to Qena (Roman Maximianopolis) on the Nile, which Ptolemy put on his second-century map, was described first by Strabo and is still known as the Via Porphyrites (the Porphyry Road). Its track is marked by the hydreumata, or watering wells, which made it viable in this utterly dry landscape. After the fourth century, this quarry was lost to sight for many centuries. The scientific members of the French Expedition under Napoleon sought for it in vain. It was only when the Eastern Desert was reopened for study under Muhammad Ali, viceroy of Egypt, that the site was rediscovered by Burton and Wilkinson in 1823. All the porphyry columns in Rome, the red porphyry togas on busts of emperors, the porphyry panels in the revetment of the Pantheon, as well as the altars, vases, and fountain basins reused in the Renaissance and dispersed as far as Kiev, all came from the Mons Porpyritis quarry—the stone is not naturally present in Italy. Constantine I celebrated the founding of his capital of Constantinople with a 30-meter (100-foot) pillar, built of seven stacked porphyry drums. This pillar still stands. A triumphant last use were the eight monolithic columns of porphyry that support exedrae (semicircular niches) in Hagia Sophia. Justinian's chronicler, Procopius, called the columns "a meadow with its flowers in full bloom, surely to make a man marvel at the purple of some and at those on which the crimson glows" (Werner 1998). The Romans also used the Imperial Porphyry for the monolithic pillars of Baalbek's Temple of Heliopolis in Lebanon. Byzantine historians distinguish two sorts of emperors: those who won power through a coup and those "born to the purple." Those in the latter group, known as "porphyrogenites," were born to the imperial family in a room in Great Palace of Constantinople veneered with purple porphyry, as described by Anna Comnena, daughter of the eleventh-century emperor Alexius I. In addition, members of the imperial family were entombed in the purple stone. It appears that Nero was the first to be immured in a porphyry sarcophagus. Roman sarcophagi were reused for imperial burials in Sicily. The porphyry sarcophagi of Holy Roman Emperors Frederick II and Henry IV and king William I of Sicily and the Empress Constance are preserved in the cathedrals of Palermo and Monreale. Porphyry was used extensively for decoration in Germany, Poland, and Czechoslovakia. This can be seen in the Mannerist style sculpted portal outside the chapel entrance in Colditz Castle. Also, King Louis XIV of France obtained the largest collection of porphyry by acquiring the Borghese collection. In 1840, Bonapartists recovered the body of Napoleon I from Saint Helena and intended to bury it in a porphyry sarcophagus in Les Invalides, Paris. However, the Egyptian quarry was not available and a similar red quartzite from Finland was chosen, in spite of its purchase from the Russian Empire, an enemy of France. Rhomb porphyry is a volcanic rock with gray-white large porphyritic rhomb-shaped phenocrysts embedded in a very fine grained red-brown matrix. Rhomb porphyry lavas are known from only three rift areas: The East African Rift (including Mount Kilimanjaro), Mount Erebus near the Ross Sea in Antarctica, and the Oslo graben in Norway. ↑ Feldspathic refers to material that contains feldspar. Werner, Louis. 1998. Via Porphyrites. Saudi Aramco World. Retrieved May 18, 2007. Pictures of the Mons Porphyrites, Red Sea, Egypt. This page was last modified on 26 May 2015, at 18:43.